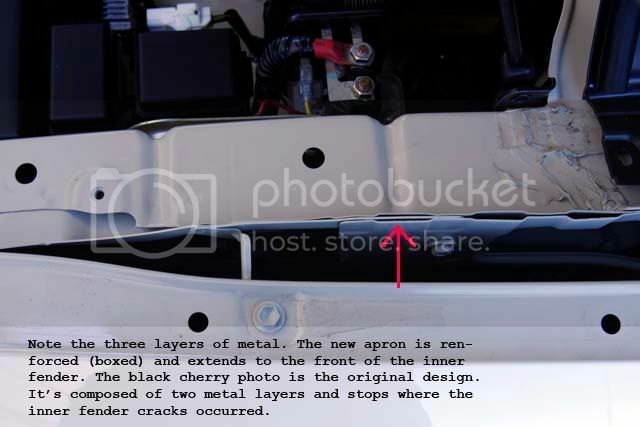 Toyota FJ Cruiser Forum > Toyota FJ Cruiser Discussion > Problems / Dealer Service > Proof of new inner fender design! Proof of new inner fender design! For all who have waited for an inner fender fix, I have great news! As some of you know, Bernd was the first to report the “Engine bay body rips”. Many, including myself have had the inner fender aprons replaced only to have them “rip” again. Others have been waiting for a “permanent fix”. I can tell you with certainty that a fix has been instituted on my new 2008 (build date 7/2008) FJ. See photos below. For those wanting to know if they have the new design do the following. Remove the plastic cover under the hood and on top of the fender. Compare to the photos below. If you have three layers of metal where indicated, you have the new design! Re: Proof of new inner fender design! 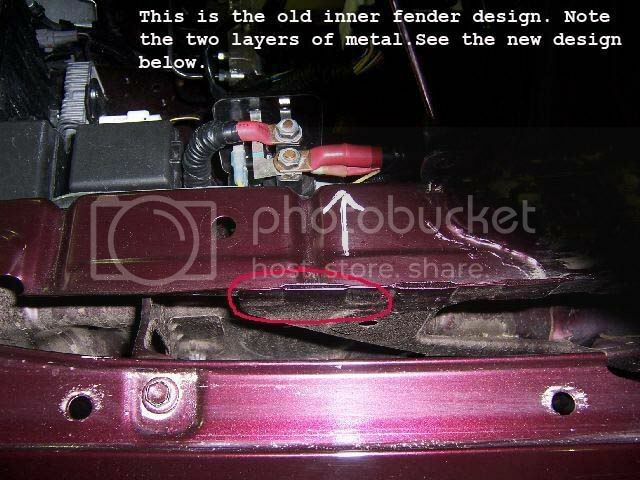 Looks like another giveaway is the bolt down inside the fender (next to the red arrow in the picture). I guess that holds the three pieces together? Nice examples Relic. I know I don't have it, but I know what to tell Toyota to do now if it ever happens to mine. The guys at MAF found a fender bulge on the drivers side. No tear yet. Didn't even know it was there. Off the the dealership for who knows what. Walker Evans 2.5 dia. front shocks, adj. rear reservoir shocks, Pro Links. AP F&R bumpers, AP 1.25" UCA, Demello skid, TMax 9000 Competition winch. Viking Trail Line. Hankook MT RE03. Trail Gear Sliders, Aeroflow, Lightforce Blitz 240 50W HID, All Pro Swing Out. Bajarack custom low-pro rack. Ricochet LCA armor. That's pretty much what I was thinking. I guess we'll see if just that little bit is all it's going to take to address the problem. I had mine documentd last time I was at the dealership getting my pulleys replaced. My passenger side fender is now misaligned with the hood at the top front corner almost like the fender is creeping backward. I'll have to take a drive to the dealership after my last run of the season and see what they're willing to do for me. 2007 Titanium Metallic and YES I wheel it! RASTA Full Aluminum Skids, Lots of Badges! Last edited by MawlCrawlr; 09-15-2008 at 08:43 PM. My passenger side fender is now misaligned with the hood at the top front corner almost like the fender is creeping backward. My drivers side fender contacts the hood now and is putting a dent in the hood from vibration. Yup thieves are stupid, that's why they are thieves. Have you been to the service department with it? Its difficult to show all the changes that have been made without taking the outer fender off, but I can tell you that the difference is substantial! The inner fender is now boxed. And the reinforcement is almost twice as thick as the fender material (around 22mil). If you look at the left side of the pictures you will see that there is a significant difference. The reason for using the pictures I did was for people to check for themselves if they have the new inner fender design, not to show all the changes Toyota has made. I know that only time will make believers out of some, but I can tell you from my experience with racing and offroading that this is no Band-Aid fix. Last edited by Relic hunter; 09-15-2008 at 06:38 PM.